It’s back-to-school season, and that means that you and your family may not be at home as much as you have been during the summer months, making it important to pay a little extra attention to your pup. You might notice that your change in schedule causes a little bit of uneasiness in your dog, which can manifest itself in different ways, from all-day barking, to chewing your carpets or furniture, to urinating in the home when your pet was previously well behaved. Don’t be alarmed; this doesn’t mean that your dog has suddenly forgotten all of his or her training, it just means that they have a little bit of separation anxiety. It’s perfectly normal for dogs to have a bit of anxiousness when schedules change around the house, like when it’s time for the kids to go back to school. The first thing you can try to help your dog cope with his or her separation anxiety is to make your home a fun and comfortable place for your pet to be left alone. One useful technique is to leave your pet with a puzzle toy right before you leave the house in the morning. Stuffed with a treat or a bit of peanut butter, these treats help to keep your dog’s focus and occupy their attention for 20 to 30 minutes. Keep in mind, however, that this will likely only work for dogs with mild cases of separation anxiety. 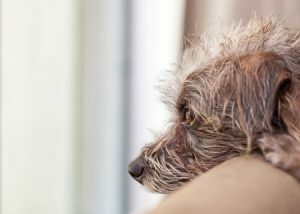 If your dog’s separation anxiety is more severe, you may need to enlist the help of a professional trainer to help recondition your dog to understand that he or she should not be fearful when left alone. This is accomplished over a series of training sessions and may take some time, but with tips and hints from an expert, your dog will feel comfortable and at ease in your home, and won’t be afraid when you’re not there. If it’s possible to have a friend or a neighbor look in on your dog during the day, that could greatly decrease their separation anxiety, as well. Doggy daycares are also a popular option for pet owners if training sessions aren’t an option or haven’t been successful. For most people, the key is to find the right combination of many approaches that work for your pet and your family. At Pauley’s Pups, we offer well-behaved and socialized friends who are perfect options to join your family. Whether you’re looking for your first four-legged friend or a new companion to join the family – and maybe keep your current anxious pet at ease when you can’t be at home – we have a great selection of small-breed dogs available. Check out our puppies for sale today, or contact us for more information on any current dog or upcoming breed availability.